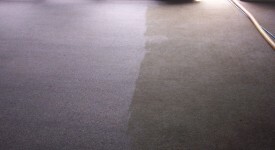 What to do in case of fire or soot damage - Catamount Carpet Cleaning, Inc. The fire trucks may be gone but without proper immediate response, the real damage and the costs are just beginning. 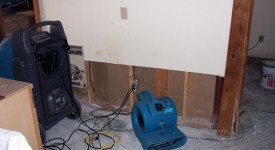 To return your residential or commercial property to its pre-loss condition requires professional restoration. This is not the job for a do-it-yourself property owner. Practice safety first. Use a dust mask (like painters use) and gloves as you work. Ventilate the home. Place a box fan in an open window to draw the air and dust out. 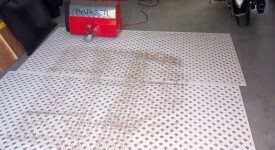 Vacuum floors and upholstery. Make sure your vacuum cleaner has a high efficiency filter. Otherwise, you risk blowing soot back into the air. Some draperies, clothing and machine-washable items may be laundered. Use a mild alkaline cleaner to neutralize the acid in the soot. Fine clothing should be dry cleaned. 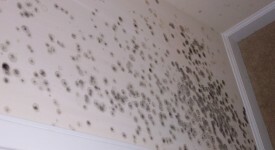 Most exterior walls (brick, stone, wood, paint, siding) and eaves can be cleaned by spraying with a detergent, agitating soot with a soft-bristled brush, pressure washing from bottom to top, then rinsing from top to bottom. If the damage and residue are heavy, it may be best to hire a professional to thoroughly restore your home and belongings. Check with your insurance company to see if smoke damage from outdoor sources is covered by your policy. 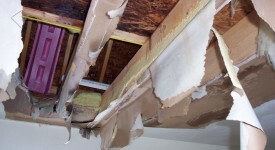 If the fire has warped or distorted the structure, consult a licensed general contractor. 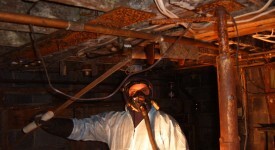 Cleaning up soot residue must be done as quickly as possible. During combustion, soot residue and volatile vapors are carried by rising and expanding air to surfaces throughout a structure, and are deposited. This process occurs repeatedly until combustion ends, with soot residue building up on surfaces layer by layer. 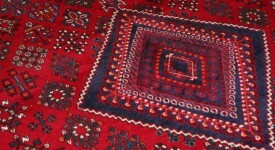 By the time restoration technicians arrive, lacquer-like soot residue may be quite difficult to dissolve and remove. Remove the source of the odor, as possible, including unsalvageable debris that contributes to odor generation and recontamination of cleaned and deodorized areas. Chase remaining odor with an odor counteractant. In the case of smoke, create a deodorizing fog or gas that seeks out and combines with odor-causing substances. Understanding the effects of a fire can help homeowners evaluate the damage to their home. By learning more about residue clean-up and deodorization after a fire, you can minimize the need for costly repair. Fire and smoke restoration experts can help you return your home and furnishings to a “pre-loss” condition.